Sometimes change is a preemptive measure — an act undertaken before it is absolutely necessary or, even worse, too late. Sometimes it is reactionary — the effect part of the “cause and effect” combo platter — and other times, it’s just a thing we didn’t know we needed until we’re right in the middle of it, recognizing the benefits. 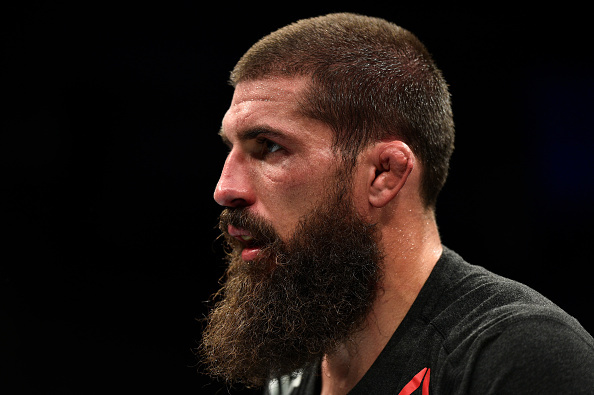 Court McGee has made some major changes since the last time he stepped into the Octagon, and in advance of his return against Alex Garcia next weekend in Moncton, New Brunswick, the former Ultimate Fighter winner is feeling refreshed and reinvigorated. “Steven Siler came out because I was injured and Ramsey (Nijem) wasn’t preparing for a fight,” he says, explaining how he came to spend this training camp working with Marc Montoya and the crew at Factory X Muay Thai in Englewood, Colorado. “The last three years have been kind of mix-and-match — whoever wasn’t fighting was coaching. McGee’s resolve and overall toughness have never been in question, as his story of battling addiction to become a person in long-term recovery and rising to compete on the biggest stage in the sport is well documented. On top of that, the 33-year-old father of two has battled through numerous injuries, including a two-year stretch on the sidelines due to persistent wrist and hand issues and a torn labrum that required surgery following his last outing against Sean Strickland late last year. But while toughness and resolve can carry you far in any venture, including a career in the Octagon, there are still limits to how far you can get on toughness and resolve alone, and since returning from that two-year layoff, McGee had reached a point where those attributes and the preparation he was getting at home in Utah weren’t enough to allow him to get his hand raised inside the Octagon. Since defeating Marcio Alexandre Jr. at UFC 194 in Las Vegas, “The Crusher” has dropped three of four outings, suffering the first stoppage loss of his career against still rising contender Santiago Ponzinibbio and back-to-back decision losses to Ben Saunders and Strickland. He’s shown that trademark toughness and made each of those last two outings close, but the extra gear, the extra sharpness needed to turn a close loss into a convincing win hasn’t been there. He feels like it is now. “Marc is an excellent coach — he’s up with the times, he’s motivating — and I’ve got four or five guys gunning for me, pushing me every week,” says McGee, whose record stands at 19-7 overall as he prepares to make his 14th appearance in the Octagon next weekend. “It’s something that I’ve been missing for a couple years. “I’ve got my teammates, but you train with the same guys for 10 years and you get each other figured out. So instead of having to make up for the lack of partners with extra conditioning, I have an excess of partners to drill with, so my drill time increases greatly. It’s probably four more hours a week of me going one-on-one with a guy like Ian Heinisch, a tough wrestler and heavy hitter who moves forward with great power and is a 185-pounder, so he’s a little bit bigger than me. Having struggled in recent years and with multiple opportunities outside of the cage, a two-fight skid and the prospect of another surgical procedure and lengthy recovery might have been enough to make the former TUF winner take stock of his career and ponder moving on to the next phase of life. But the thought never crossed McGee’s mind, and after having the surgery and measuring his progress against that of welterweight champion Tyron Woodley, who had a similar surgery a few months prior, the welterweight veteran shifted his focus to not only getting back into the cage, but returning to the win column and proving he’s one of the top fighters in the division as well. “I had no consideration of stopping whatsoever,” he says. “The doctor said, ‘This is one of the more painful surgeries,’ but I was thinking, ‘You have no idea what I’ve been through.’ I can take some pain and let me tell you — the level of discomfort was up there with some of the most uncomfortable positions I’ve put myself in and pain-wise, it was off the charts; six weeks of no moving. “But I never, ever thought, ‘Maybe this is it.’ I knew I was coming back and I was going to do whatever it took to get here. With nearly a year on the shelf, another surgery in the rearview mirror, and the positive energy of putting in several hard weeks alongside Heinisch, Camozzi and one half of next weekend’s headlining duo, Anthony Smith, racing through his system, McGee is counting down the days until he can finally cross the threshold into the Octagon again, but he won’t let that excitement get the better of him. Instead, the returning veteran will continue to hold on to it, continue to prepare the same way he has for the past bunch of weeks in Colorado until the cage door closes and it’s time for he and Garcia to figure out who the better man is. And if things go his way, “The Crusher” will get to savor one of the sweetest victories of his professional career Saturday night in the Maritimes. “I’m going to hold back that excitement and energy until it’s time to train and until it’s time to cut weight and as soon as I go out there and they say, “Fight!’ I’m going to let all of that come out in practical application,” says McGee. “I’m excited to let it all come out in the fight.